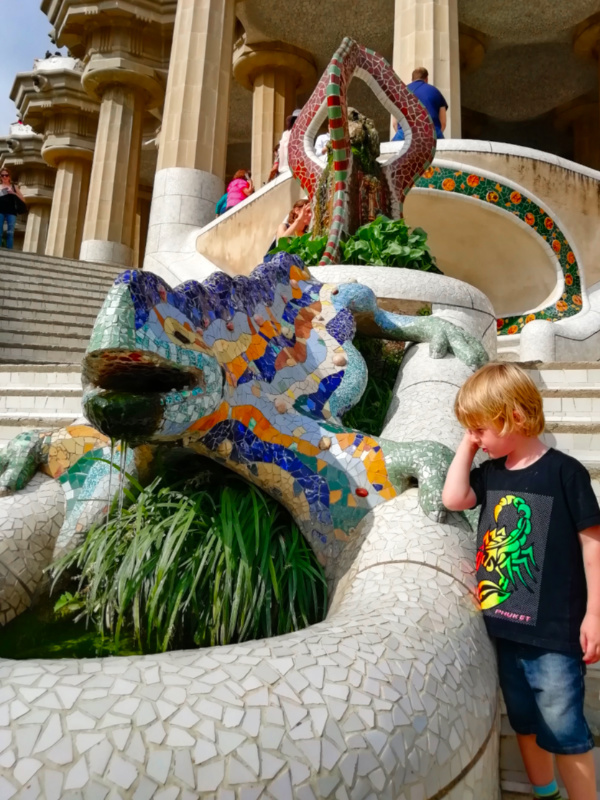 This is part 2 of my appraisal of Barcelona with kids. If you haven’t read part 1 then click through to read about Las Ramblas, the port, Mercat de la Boqueria and much more. Or you could stay here and read about how we got on at the Sagrada Familia, the magic fountains and Park Güell. The day finally dawned when I would get to experience the Sagrada Familia. This is the primary reason I wanted visit Barcelona with kids. Our entry tickets were for the afternoon but we headed straight there. I wasn’t let down by the magnificent building but the grumpy family did dampen my mood. Once again, we were trying to cram in too many sights in too little time. We played in the adjacent playground and were rewarded for having children with our own space to take pictures. With hours in hand before our time slot for entry we set out for a stroll up Avenue de Gaudi. A chat, a lolly and some wonderful art deco architecture turned everyone’s moods around. Throw in some tasty vegan food and we headed back to the Sagrada Familia with happy hearts. I’m running out of superlatives to describe the Sagrada Familia. It was nothing short of spectacular, inside and out. It’s something you need to experience first hand to really understand what all the fuss is about. Pictures don’t do it justice. As we anticipated Ted was overawed by the place. We gave him an old phone and he spent the whole time taking pictures. Many pictures. His favourite thing was the light from the stain-glassed windows. David and I could have spent significantly more time studying every detail. We had to quit while we were ahead. 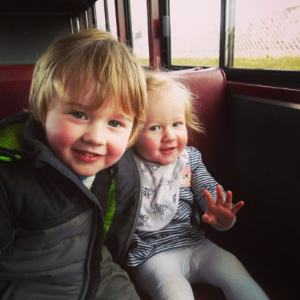 May was complaining about being confined to the pushchair and Ted had run down the phone battery. 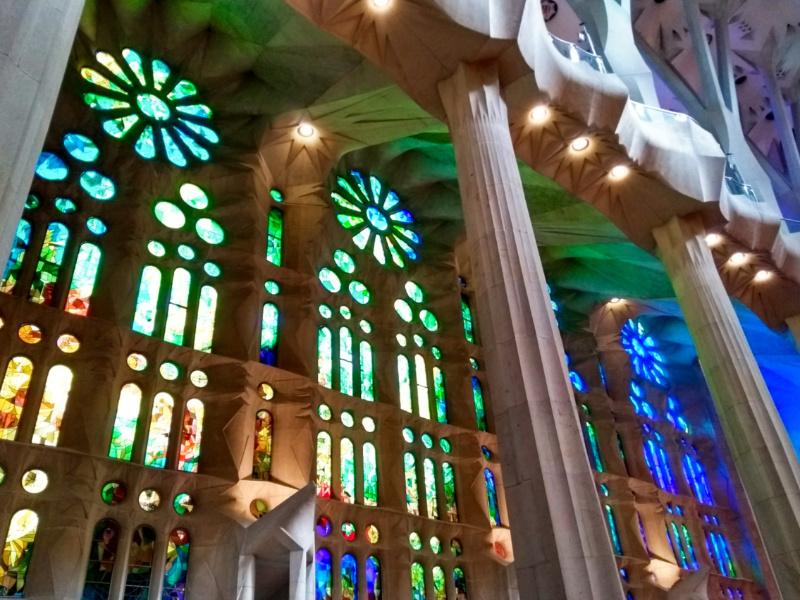 Read more of my hints and tips for a visit to the Sagrada Familia with kids here. Buy tickets well in advance. This goes for both the Sagrada Familia and Park Güell (see below). Both were sold out for the next day when I tried to book and we couldn’t get our preferred time slots. Giving Ted a phone to take pictures with was a stroke of genius. Vegan fast food restaurant La Trocadero was amazing. Even if you don’t usually eat vegan it’s worth checking out. It’s just round the corner from the Sagrada Familia. A chat and an ice lolly will fix most things. Our amazing day didn’t end when we left the Sagrada Familia. We had big plans for the evening too. For the first time we took the metro. 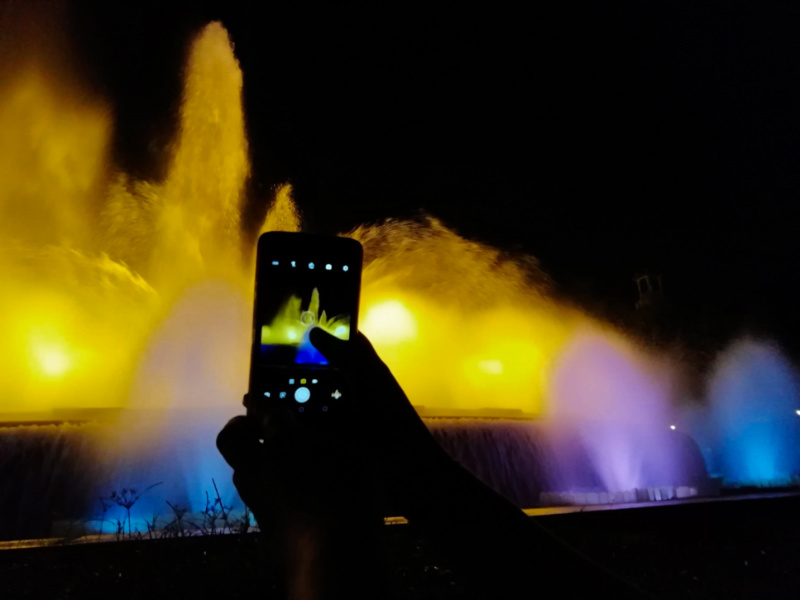 We headed to Plaça d’Espanya to catch the Magic Fountains show. Plaça d’Espanya is an incredible looking place. The view from Arenas de Barcelona (the old bullring, now a shopping centre) up to The Magic Fountain in one of the best in a city full of spectacular views. The Magic Fountain show has water from the fountain dancing to music. From the opening song (Barcelona by Freddie Mercury and Montserrat Caballé) Ted was captivated. May, not so much. She was asleep within minutes. The show lasted for an hour but most people left after the opening couple of numbers. We had more staying power and took advantage of the thinning crowds to move into a better spot. When it finished we returned to the metro wet and happy. Read more of my hints and tips for The Magic Fountains here. Times and days for the show vary by season so make sure you check the website in advance so you don’t miss out. Try to get there early to get a good spot but the crowd will thin so if you find yourself behind a tall person at the beginning don’t worry too much. Be prepared, if you’re anywhere near the fountain you will get wet. 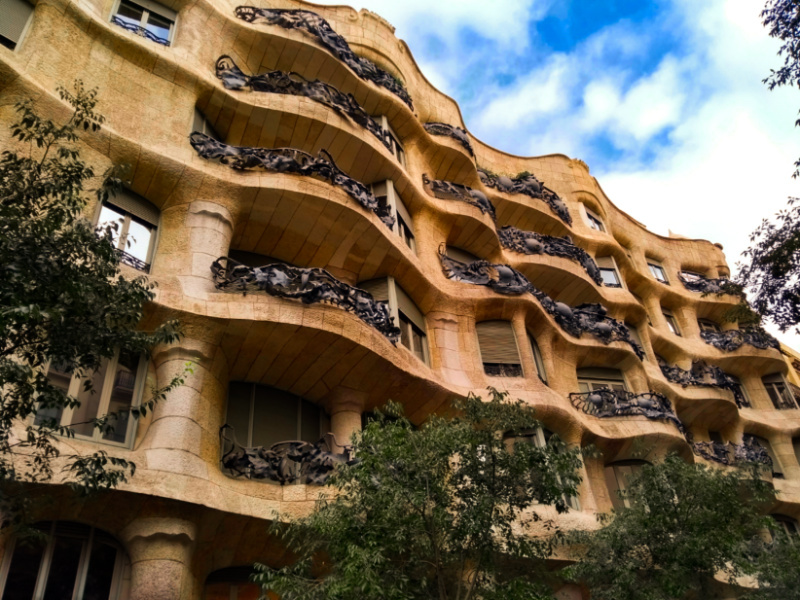 I had ruled out visiting the Gaudi designed apartments because I knew the kids would only stand so much architecture. However, I couldn’t book tickets for Park Güell until the afternoon so we thought we should at least walk past. This turned out to be unusually tricky. As we approached the first apartment we began to notice large groups of locals gathering with National flags draped across their shoulders. A quick Google told us it was a National holiday. This didn’t affect us too much except that the crowds were gathering for a march starting outside our second Gaudi apartment. The crowds were too much for the kids so we took a couple of pictures and got out of there quick. We decided to avoid the busy metro and walk. 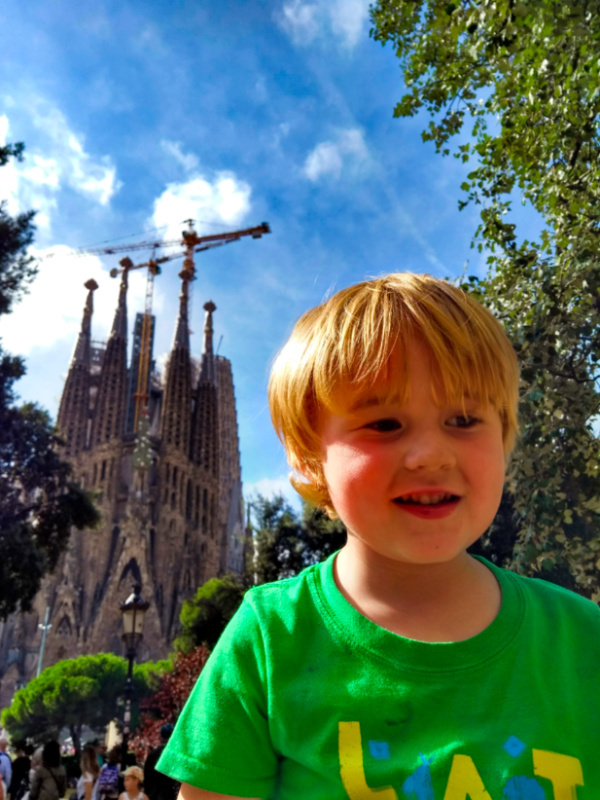 It’s doubtful whether another stroll was a good idea, especially on such a hot day but this was our last day in Barcelona and we wanted to see all that we could see. Check for national holidays before you fly anywhere and prepare for disruption. For me Park Güell was second only to the Sagrada Familia on my list of places I wanted to visit in Barcelona. There are two sides to our visit. First the downside. We were all tired, hot and a little jaded from our long week of sightseeing. The crowds were as bad as we had been warned they would be. Worse though was many of the paths had been closed for repairs making the park very difficult to navigate with a pushchair. On the positive side, there is a reason the crowds are drawn here. It is a wonderful place that on another day would have been full of magic for the kids. Ted loved meeting the lizard and running around in all the unexpected places there were to play. I have made a list of all the places we would like to see again in Barcelona. Park Güell is top of that list. Next time I will check for building work in advance and book my tickets earlier. Read more tips for Park Güell in this post. As with the Sagrada Familia, book your tickets for Park Güell early to get the best time slots. Check for building work. Although there’s probably not much you can do about it. It is possible to see much of the park without paying to go in but I think it was well worth the money. The entrance system does look a bit mad when you first arrive but it does make sense and the staff are very helpful. 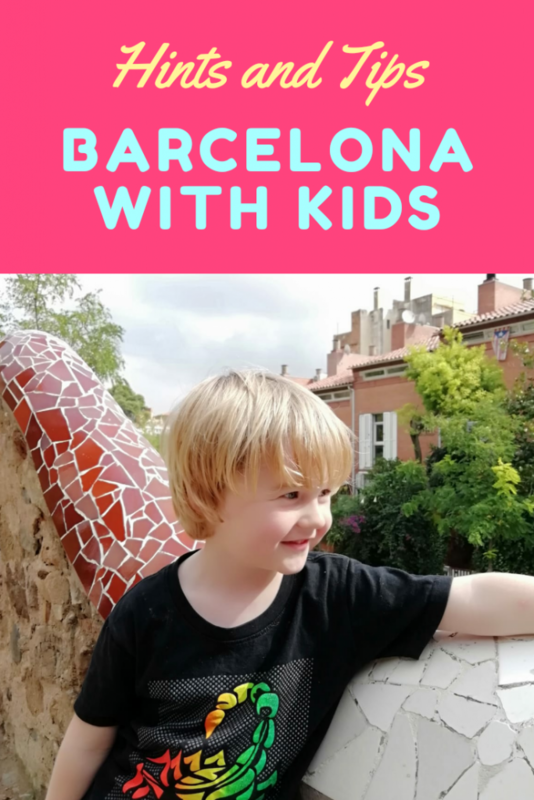 Is Barcelona with Kids a Good Idea? Quick answer, yes Barcelona with kids was a really good idea for us. The children probably won’t remember the majesty of the Sagrada Familia. Or the view from the cable car. Or holding hands as they explored Park Güell. There’s no denying that we chose Barcelona as a destination for us. So why travel with children at all? Why not wait a few years and have an altogether easier, more relaxing visit. Just because they won’t remember it doesn’t mean they didn’t get anything out of it. For us the most important thing is quality family time. At home work is intense and invasive. On holiday we can step away and focus on family. The chance to inject some culture into our lives is important. We explained to the three year old that some people live differently, use different words and spend different money. Having him experience that first hand really drove it home. I have two questions for you. 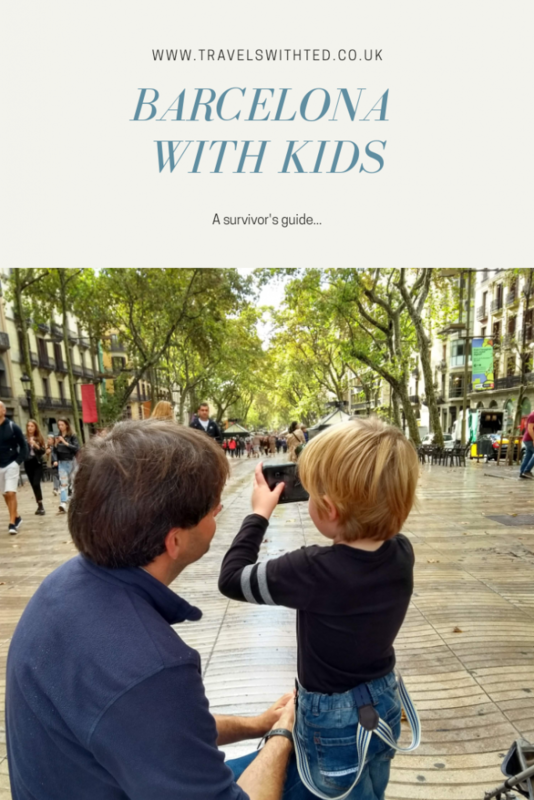 First, having read this blog, do you think Barcelona with kids is a good idea? Second, where do you think we should go next? We’ve got some ideas but we would welcome all suggestions. I love how your son was able to interact with all of the sights. Looks like a fabulous family destination.